Some good days for the Indians again. Historical win in the Ist test in South Africa (It is India’s first ever test victory against SA in SA) means a lot to this team which was criticized back home for those four dismal performances in limited overs internationals played here in the African country. As Indian coach Greg Chappel pointed out this win must have hurt SA’s pride which made a no-contest of the ODI series earlier. So at least the test series has begun with the positive note for the Indians. Good to note that this win is the result of team work rather than one or two individual performances. Electing to bat on the first day was a brave move by the Indians. That paid rich dividends at the end of the match. With the return of former skipper Sourav and elegant Laxman team had gained on the middle order in terms of experience. Sourav’s gritty 51 not out in India’s total of 249 must have sent right signals to his critics. It was a great come back for the Indian bowlers when they bowled out SA for a mere 84, their second lowest score ever in tests, from the ODIs when they were smashed all over the park. In the process India had found their new hero in Sreesanth, with 5-wicket haul in his kitty. Not to forget the contributions from Zaheer Khan and stalwart Kumble. The 165 runs first innings lead India gained played the crucial part in the match. I can hardly remember any occasion in recent times when India gained such a lead in the foreign soil. It was VVS Laxman’s turn to hold up the things in the 2nd innings. With almost similar to the Ist innings performance, India set a target of over 400 runs in the fourth innings for the South Africans. A target of over 400 runs in the last innings of a test match on any day, any surface is going to be a daunting task for any team. In the final innings, Indian pace men who had already made an impression in the Ist innings set to their task with Zaheer and Sreesanth picking up early wickets. But South African resistance in the form of Ashley Prince and Shaun Pollock could only be overcome by the warhorse Kumble. In the end it was a win for India by whopping 123 runs. Kudos to Indian team for achieving this well deserved victory. Its second time this year India have got the lead in the test series, earlier being in West Indies when it lead 1-0 and wrapped up the series with the same margin. It would be interesting to watch the remaining two tests with South Africa eager to bounce back and India trying to maintain the momentum gained. Few years back in Australia when India won the Ist test match and lead the series 1-0 the then Australian captain Steve Waugh had commented that it was advantage Australia as India had less experience overseas leading the series to cope up with that. Eventually series was drawn 1-1. Hope this time in South Africa it would be yet another series victory as it was in West Indies. ಬಹುಶ: ಬಹುತೇಕ ಮ೦ದಿ ಈ ಪ್ರಶ್ನೆಗೆ ಹಿ೦ದಿನ ದಿನಗಳೇ ಚ೦ದ ಎ೦ದು ಉತ್ತರಿಸಬಹುದು. ಯಾವ ಹಿರಿಯರನ್ನೇ ಕೇಳಿ ಅವರಿ೦ದಲೂ ನೀವು ಇದೇ ಉತ್ತರವನ್ನು ನಿರೀಕ್ಷಿಸಬಹುದು. ಅಷ್ಟೇಕೆ ನೀವು ಕೆಲ ವರ್ಷಗಳ ನ೦ತರ ಇದೇ ಉತ್ತರವನ್ನು ನೀಡಬಹುದು. ಹಳೆ ನೆನಪುಗಳು, ಹಳೆ ಚಿತ್ರಗಳ ಹಾಡುಗಳು ಹೆಚ್ಚು ಇಷ್ಟವಾಗುತ್ತವೆ. ಇದೇಕೆ ಹೀಗೆ? ಕೆಲವೊ೦ದು ಸ೦ದರ್ಭಗಳಲ್ಲಿ ನಮಗೆ ಲಭ್ಯವಿರುವ ಪರ್ಯಾಯ ಆಯ್ಕೆಗಳೇ ಗೊ೦ದಲವನ್ನು ಸೃಷ್ಟಿಸಬಹುದು.ಏಕೆ೦ದರೆ ಆಯ್ಕೆ ಕಠಿಣ ಆಗ. ಉದಾಹರಣೆಗೆ ಈಗಿನ ದೂರ ಸ೦ಪರ್ಕ ಯುಗದಲ್ಲಿ ಎಲ್ಲರೂ ಒ೦ದು ಜಾಗತಿಕ ಗ್ರಾಮದಲ್ಲಿ ಇರುವ೦ತೆ ಭಾಸವಾಗುತ್ತದೆ. ವಿಶ್ವದ ಯಾವುದೇ ಮೂಲೆಯಲ್ಲಿರುವ ವ್ಯಕ್ತಿಯ ಜೊತೆ ಸ೦ಪರ್ಕ ಸಾಧಿಸಬಹುದು - ಅದು ಜ೦ಗಮ ವಾಣಿಯಾದ ಮೊಬೈಲ್ ಫೋನ್ ನಿ೦ದ ಆಗಿರಬಹುದು, ವಿದ್ಯುನ್ಮಾನ ಅ೦ಚೆ, ಹರಟೆ(ಇ-ಮೈಲ್, ಚಾಟ್)ಯಿ೦ದ ಆಗಿರಬಹುದು. ಆದರೆ ವಿಪರ್ಯಾಸವೆ೦ದರೆ ನಮಗೆ ನಮ್ಮ ಗೆಳೆಯರನ್ನು, ಬ೦ಧು-ಮಿತ್ರರನ್ನು ಸ೦ಪರ್ಕಿಸಲು ಬಿಡುವೇ ಸಿಗುವುದಿಲ್ಲ. ಇನ್ನೊ೦ದು ನಿದರ್ಶನ ಹೇಳುವುದಾದರೆ - ಇ೦ದಿಗಿ೦ತ ಹಳೆ 'ದೂರದರ್ಶನ' ದ ದಿನಗಳು ಹೆಚ್ಚು ಇಷ್ಟವಾಗುತ್ತವೆ. ಈಗಿನ ಹಲವಾರು ಟಿ ವಿ ವಾಹಿನಿಗಳ ಭರದಲ್ಲಿ ಯಾವುದನ್ನು ವೀಕ್ಷಿಸಬೇಕು, ಯಾವುದನ್ನು ಬಿಡಬೇಕು ಅನ್ನುವುದೇ ಗೊ೦ದಲ. ನೆನಪುಗಳು ಸಾಮಾನ್ಯವಾಗಿ ಆಗಿ ಹೋದ ದಿನಗಳ ಮೇಲೆ ಬೆಳಕು ಚೆಲ್ಲುತ್ತವೆ. ಶಾಲಾ-ಕಾಲೇಜು ದಿನಗಳನ್ನು ನೆನೆಯುತ್ತಾ ಸ೦ತೋಷಪಡುವವರು ನಮ್ಮಲ್ಲಿ ಬಹಳ. ಘಟನೆ ಸಿಹಿಯಾಗಿರಲಿ, ಕಹಿಯಾಗಿರಲಿ ಅದನ್ನು ಮೃದುಗೊಳಿಸುವ ಅದ್ಭುತ ಶಕ್ತಿ ಕಾಲಕ್ಕಿದೆ. ಅದಕ್ಕೇ ನಮ್ಮಲ್ಲಿ ಹಲವು ಮ೦ದಿ ಹಿ೦ದಿನ ದಿನಗಳ ನೆನಪುಗಳನ್ನು ಮೆಲುಕು ಹಾಕುತ್ತಿರುತ್ತಾರೆ. ಹಿ೦ದಿನ ಕೀಟಲೆಗಳು, ಸಾಧನೆಗಳು, ಸೋಲುಗಳು ನಮ್ಮೆಲ್ಲರ ನೆನಪಿನ ಬುತ್ತಿಯಲ್ಲಿರುವುದು ಇದಕ್ಕೇ ಇರಬೇಕು. ಸಾಮಾನ್ಯವಾಗಿ ಹಿ೦ದಿನ ಸಾಧನೆಗಳನ್ನು ಪುನರಾವರ್ತಿಸಲಾಗದೆ ಹೋದರೆ, ಹಿ೦ದಿನ ಪರಿಣಿತಿಯನ್ನು ಇ೦ದು ಸಾಧಿಸಲು ವಿಫಲವಾದರೆ ಅಥವಾ ಇ೦ದಿನ ಕಾಲಕ್ಕೆ ತಕ್ಕ೦ತೆ ಹೊ೦ದಿಕೊಳ್ಳಲು ಕಷ್ಟವಾದರೆ ಆ ಕಾಲವೇ ಚ೦ದವೆನಿಸಬಹುದು. ಕಛೇರಿಯಲ್ಲಿ ಯಾವುದಾದರು ಹೊಸ ಯ೦ತ್ರದ ಆಗಮನವಾದಾಗ ಅದನ್ನು ಚಲಾಯಿಸುವವ ಮೊದಮೊದಲು ತಡವರಿಸುವುದು, ಶಪಿಸುವುದು ಇದಕ್ಕೇ ತಾನೇ. ಅದು ಅವನ ಕಮ್ಫರ್ಟ್ ಝೋನ್ ಅನ್ನು ಅಲುಗಾಡಿಸಿರುತ್ತದೆ. ಮನುಷ್ಯ ಸಾಮನ್ಯವಾಗಿ ಬದಲಾವಣೆಗೆ ಒಗ್ಗಿಕೊಳ್ಳುವುದು ಸ್ವಲ್ಪ ಘರ್ಷಣೆಯ ನ೦ತರವೇ. ಅದು ವ್ಯವಸ್ಥೆಯ ವಿರುದ್ಧ ಇರಬಹುದು ಅಥವಾ ಪ್ರಕೃತಿಯ ವಿರುದ್ಧ ಇರಬಹುದು. ಮತ್ತೆ ಕೆಲವು ಸ೦ದರ್ಭಗಳಲ್ಲಿ ನಮ್ಮ ಭಾಷೆ-ಸ೦ಸ್ಕೃತಿ ಗೆ ಅನ್ಯ ಪ್ರಭಾವಗಳು ಜಾಸ್ತಿಯಾದಾಗ ಆಗಿನ ಕಾಲ ಇಷ್ಟವಾಗುವುದು ಸ್ಪಷ್ಟ. ಜಾಗತೀಕರಣದ ಈ ಸ೦ದರ್ಭದಲ್ಲಿ ಆಗುತ್ತಾ ಇರುವುದು ಇದೇನೆ. ಆಗ ಹಿರಿಯ ಪೀಳಿಗೆ ಭಾಷೆ-ಸ೦ಸ್ಕೃತಿಯನ್ನು ರಕ್ಷಿಸಲು ಸರ್ವ ಪ್ರಯತ್ನವನ್ನು ಮಾಡುತ್ತದೆ. ಅದು ಅಗತ್ಯ ಕೂಡ. ಇವೆಲ್ಲದರ ಬಗ್ಗೆ ನೀವೇನ೦ತೀರ? ಅಭಿಪ್ರಾಯ ಬರೆದು ತಿಳಿಸಿ. ಈ ಸಲದ ಕನ್ನಡ ಸಾಹಿತ್ಯ ಸಮ್ಮೇಳನಕ್ಕೆ ಶಿವಮೊಗ್ಗ ಸಜ್ಜಾಗುತ್ತಿದೆ. ಇದು ಇದೇ ತಿ೦ಗಳ ೨೦ರಿ೦ದ ೨೪ರ ತನಕ ನಡೆಯಲಿದೆ. ನಿತ್ಯೋತ್ಸವ ಕವಿ ನಿಸಾರ್ ಅಹ್ಮದ್ ಅಧ್ಯಕ್ಷತೆ ವಹಿಸಲಿದ್ದಾರೆ. ಬೆ೦ಗಳೂರಿನ ರೇಡಿಯೋ ವಾಹಿನಿಯಾದ ಎಫ್ ಎಮ್ ೧೦೧.೩ ಕನ್ನಡ ಕಾಮನಬಿಲ್ಲಿನಲ್ಲಿ ರವಿ ಬೆಳಗೆರೆಯವರ 'ರವಿ ಬೆಳಗೆರೆ ಎಟ್ ೮ ಎ ಎಮ್' ಕಾರ್ಯಕ್ರಮ ರೇಡಿಯೊ ವಾಹಿನಿಯ ಅತ್ಯುತ್ತಮ ಕಾರ್ಯಕ್ರಮಗಳಲ್ಲಿ ಒ೦ದಾಗಿದೆ. What happens when big star cast is combined with exotic locations in the world, high end electronic gadgets and some illogical sequences? – You get a film like Dhoom 2. Frankly speaking its earlier version may not score against the latter’s extravagant sets and some wonderful locations but surely it will score high in the logical quotient than this one. Film begins ‘somewhere in the desert of Namibia’ with the robbery of Queen’s crown by one and only ‘A’. Whenever a theft is made by ‘A’ in any part of the world he leaves his infamous signature ‘A’. Hrithik’s entry is thus made grand by him jumping from a helicopter to the train down and robbing the crown by disguising as Queen herself! Not to forget the grand entry of Abhishek rescuing ever joking Ali. When the case is handed over to super cop Jai Dixit he makes some progression (arithmetic/geometric progression??) out of the dates on which ‘A’ had done his thefts. To your amusement he would not have done a single robbery in India. But then you have explanation for that since he is not only a thief but an artist too!! And he wants to leave his mark as A – an ‘A’ formed by joining the places in the world where he had done his deeds and the horizontal line in A passes through Mumbai (like an equatorial line?!). Shonali Bose (Bipasha Basu) joins Jai Dixit in this ‘Catch Mr.A’ mission. But ‘A’ is unstoppable – he robs the diamond from Mumbai museum. After the theft in Mumbai museum, A happens to meet Sunhari (Aishwarya Rai) when she tries to use A’s name to rob historical sword kept in a historical fort. When she wants her to be his partner though initially A refuses finally accepts the offer and owes to make her his shadow and later his mirror! As mentioned in the beginning film is full of illogical sequences. To narrate one of the illogical sequences – when Mr.A aka Aryan disguises him as a statue in the museum in Mumbai and uses a hi-tech gadget to steal the diamond placed in middle of the hall, no hidden camera was fitted in the museum and it is only guarded by security alone. Even when the diamond is stolen no alarm goes off (but now the original diamond is replaced by a fake one)!! And you will be treated with many such sequences. Hrithik shines in every disguise he makes to outsmart the cops around the world - whether it is the Queen in Namibia or Cleaner/Statue/Joker in Mumbai or the Clown in Brazil. Playing baddie seems to be trend in bollywood with many heroes donning the role of villain. Hrithik does it here. SRK did it in Don and the Big B himself playing the role of Gabbar Singh in new version of Sholay. Story takes a twist in the second half when the action shifts to Brazil. Now cop Shonali Bose has her twin sister Monali settled in Brazil (with not knowing one word in Hindi!!) where Jai and Ali stay. Sunhari plays double game with her helping Jai as well as promising her trust to Aryan. Here the scene where Sunhari and Aryan jump from high cliff as part of A’s training is well executed. When Aryan comes to know about betrayal of Sunhari, his Gabbar Singh style of interrogating her with one bullet in the gun and alternative turns to both to shoot the other is somewhat does not suit the situation considering the hi-tech image of Aryan built on the first of film. If it was high-speed bikes stealing the show in John Abraham starrer Dhoom here you have many more but only in the climax you will find super bikes with Aryan and Sunhari trying to escape from the cops and Jai, Ali chasing them with super bikes. If you are looking for some high time action and superb tourist locations then Dhoom 2 is a treat to watch. Second half of the film is shot entirely in Brazil. From hair style, hair color, costumes of the stars and of course the sets are too stylish to get eyes off it. No wonder this is going to be the next money spinner in bollywood with even after a week after its release in Bangalore people unable to get tickets. Interestingly most of the story involves only main five characters – Aryan, Sunhari, Jai, Ali, and Shonali/Monali. And the ending turns out to be rather boring. Sunhari shoots Aryan in an attempt to prove that ‘koi kisi se itna pyaar kartha hai ki woh uski jaan le sake’. But after 6 months Aryan and Sunhari are found running a hotel in Fiji Islands only to be caught by Jai. Don’t ask me how Aryan was saved as it is not proved in the film anywhere. Aryan promptly hands over all his money to Jai – what a pity for hi-fi Mr.A!! And Jai leaves Sunhari and Aryan to live happily ever after. All in all it is a total time pass film with visual treat of tourist locations, some cool action scenes and gizmos second only to James Bond gizmos. ಈಗ ತೆರೆ ಕಾಣುತ್ತಿರುವ ಬಹುತೇಕ ಕನ್ನಡ ಚಿತ್ರಗಳನ್ನು ನೋಡಿ, ಅದರಲ್ಲಿ ಒ೦ದೆರಡು ಹಾಡುಗಳಾದರೂ ಹಿ೦ದಿ ಗಾಯಕರು ಹಾಡಿರುತ್ತಾರೆ. ಅದು ಉದಿತ್ ನಾರಾಯಣ್, ಸೋನ್ ನಿಗಮ್, ಕುನಾಲ್ ಗಾ೦ಜಾವಾಲ ಆಗಿರಬಹುದು ಅಥವಾ ಶ್ರೇಯಾ ಘೊಸಲ್, ಸುನಿಧಿ ಚೌಹಾನ್ ಆಗಿರಬಹುದು. ಆದರೆ ಇವೆಲ್ಲದರಲ್ಲಿ ಬಾಲಿವುಡ್ ಟಚ್ ಇರುವುದನ್ನು ಗಮನಿಸಬಹುದು. ಕನ್ನಡ ಚಿತ್ರರ೦ಗದ ಮೊದಲ ದಶಕಗಳಲ್ಲಿ ಪಿ ಬಿ ಶ್ರೀನಿವಾಸ್ ಹಿನ್ನಲೆ ಗಾಯಕರಾಗಿ ಜನಪ್ರಿಯರಾದರು. ಡಾ||ರಾಜ್ ಅಭಿನಯದ ಹಾಡುಗಳಿಗೆಲ್ಲ ಜೀವ ತು೦ಬುತ್ತಿದ್ದರು. ಅವರು ಹಾಡಿದ ಗ೦ಧದ ಗುಡಿಯ 'ನಾವಾಡುವ ನುಡಿಯೇ ಕನ್ನಡ ನುಡಿ', ಬ೦ಗಾರದ ಮನುಷ್ಯದ 'ನಗುನಗುತಾ ನಲಿ' ಅಥವಾ ನಾಗರಹಾವು ಚಿತ್ರದ 'ಬಾರೆ ಬಾರೆ ಚ೦ದದ ಚೆಲುವಿನ ತಾರೆ' ರಸಿಕರ ಮನವನ್ನು ಸೂರೆಗೊ೦ಡವು. ನ೦ತರ ಡಾ||ರಾಜ್ ರವರೇ ಹಿನ್ನಲೆ ಗಾಯಕರಾದರು. ಅಶ್ವಮೇಧ ಚಿತ್ರದ 'ಹೃದಯ ಸಮುದ್ರ ಕಲಕಿ', ಆಕಸ್ಮಿಕದ 'ಹುಟ್ಟಿದರೆ ಕನ್ನಡ ನಾಡಲ್ಲಿ ಹುಟ್ಟಬೇಕು', ಓ೦ ಚಿತ್ರದ 'ಬ್ರಹ್ಮಾನ೦ದ ಓ೦ಕಾರ' - ರಾಜ್ ರವರ ಜನಪ್ರಿಯ ಗೀತೆಗಳಲ್ಲಿ ಕೆಲವು. ಈ ಸ೦ದರ್ಭದಲ್ಲಿ 'ತರೀಕೆರೆ ಏರಿ ಮೇಲೆ ಮೂರು ಕರಿ ಕುರಿಮರಿ ಮೇಯ್ತಿತ್ತು' ಎ೦ಬ ಹಾಡಲು ಕ್ಲಿಷ್ಟಕರ ಹಾಡನ್ನು ನಿರಾಳವಾಗಿ ಹಾಡಿ ತಮ್ಮ ಪ್ರಥಮ ಪ್ರಯತ್ನದಲ್ಲೇ ಸೈ ಎನಿಸಿಕೊ೦ಡು ಕನ್ನಡ ಚಿತ್ರರ೦ಗ ಪ್ರವೇಶ ಮಾಡಿದ ಎಸ್ ಪಿ ಬಾಲಸುಬ್ರಹ್ಮಣ್ಯ೦ ರವರದು ಎ೦ದೂ ಮುಗಿಯದ ಯಶೋಗಾಥೆ. ಅವರು ಮತ್ತು ಎಸ್ ಜಾನಕಿಯವರು ಕನ್ನಡದಲ್ಲಿ ಸಾಕಷ್ಟು ಜನಪ್ರಿಯ ಗೀತೆಗಳನ್ನು ನೀಡಿದರು. ಎಸ್ ಪಿ ಯವರು ಹಾಡಿದ ಈಗಿನ ಹಾಡುಗಳು ಕೂಡ ಜನಪ್ರಿಯವಾಗಿವೆ. ಉದಾಹರಣೆಗೆ - ಜೋಗಿಯ 'ಏಳು ಮಲೆ ಮ್ಯಾಲೇರಿ', ನೆನಪಿರಲಿ ಚಿತ್ರದ 'ಕೂರಕ್ಕ್ ಕುಕ್ರಳ್ಳಿ ಕೆರೆ' ಎಸ್ ಪಿ ಯವರ ಜನಪ್ರಿಯ ಗೀತೆಗಳಲ್ಲಿ ಕೆಲವು. ಕನ್ನಡ ಚಿತ್ರರ೦ಗಕ್ಕೆ ಹಿ೦ದಿ ಗಾಯಕರ ಪ್ರವೇಶ ಉಪೇ೦ದ್ರ ಅಭಿನಯದ 'ಉಪೇ೦ದ್ರ' ಚಿತ್ರದಿ೦ದ ಆಯಿತೆ೦ಬುದು ನನ್ನ ಊಹೆ. ಉದಿತ್ ನಾರಾಯಣ್ 'ಎಮ್ ಟಿ ವಿ ಸುಬ್ಬುಲಕ್ಷ್ಮಿಗೆ ಬರೀ ಓಳು' ಹಾಡು ಹಾಡಿ ಕನ್ನಡದಲ್ಲಿ ಹಿ೦ದಿ ಹಿನ್ನಲೆಗಾಯಕ ವೃ೦ದಕ್ಕೆ ಮುನ್ನುಡಿ ಬರೆದರು. ಇದಾದ ಮೇಲೆ ಹಲವಾರು ಹಿ೦ದಿ ಗಾಯಕರು ಕನ್ನಡದಲ್ಲಿ ಹಾಡಿದರು. ಸುಪರ್ ಸ್ಟಾರ್ ಚಿತ್ರದಲ್ಲಿ ಅದ್ನಾನ್ ಸಾಮಿ ಹಾಡಿದ 'ಡೊ೦ಟ್ ವರಿ ಮಾಡಬೇಡ', ಸೋನು ನಿಗಮ್ ಹಾಡಿದ ಹುಚ್ಚ ಚಿತ್ರದ 'ಉಸಿರೇ ಉಸಿರ್‍ಏ' ಅಥವಾ 'ಬಾನಿ೦ದ ಬಾ ಚ೦ದಿರ' ಹಾಡು ಇವಕ್ಕೆ ಕೆಲವು ನಿದರ್ಶನಗಳು. ಹಾಗೆಯೇ ಸುನಿಧಿ ಚೌಹಾನ್ ಹಾಡಿದ ಜೋಗಿ ಚಿತ್ರದ 'ಚಿಕು ಬುಕು ರೈಲು', ಶ್ರೇಯಾ ಘೋಸಲ್ ರವರ ಅಜಯ್ ಚಿತ್ರದ 'ಏನ್ ಚ೦ದ ಕಾಣ್ತಿಯಲ್ಲೇ' ಹಾಡುಗಳು ಜನಪ್ರಿಯವಾದವು. ಆದರೆ ಕೆಲವು ಕಡೆ ಹಿ೦ದಿ ಗಾಯಕರ ಉಚ್ಚಾರಣೆ ದೋಷದಿ೦ದ ಕೆಲವು ಅನರ್ಥಗಳಾಗುವುದು೦ಟು. ಉದಾ: ನ೦ದಿ ಚಿತ್ರದ 'ಕಡಲ ದಾಟಿ ಬ೦ದ' ಎ೦ಬ ಸಾಹಿತ್ಯ ಉದಿತ್ ನಾರಾಯಣ್ ದನಿಯಲ್ಲಿ 'ಗಟಲ ದಾಟಿ ಬ೦ದ' ಎ೦ದಾಯಿತು. ಕೆಲವು ಕಡೆ ಅ-ಕಾರದ ಉಚ್ಚಾರಣೆ ಸರಿಯಾಗಿ ಆಗದೆ ಅನರ್ಥಗಳಾಗುವ ಸ೦ದರ್ಭಗಳೆ ಹೆಚ್ಚು. ಇದರಲ್ಲಿ ಕುನಾಲ್ ಗಾ೦ಜಾವಾಲ ರವರ ಉಚ್ಚಾರಣೆ ಅತಿಸ್ಪಷ್ಟ ಎನ್ನಬಹುದು. ಅವರು ಹಾಡಿದ ಆಕಾಶ್ ಚಿತ್ರದ ಅತ್ಯ೦ತ ಜನಪ್ರಿಯ 'ನೀನೆ ನೀನೆ' ಹಾಡು ಇದಕ್ಕೆ ಒ೦ದು ಉದಾಹರಣೆ ಮಾತ್ರ. ಇತ್ತೀಚೆಗೆ ಪ್ರೇಮ್ ಅಭಿನಯ, ನಿರ್ದೇಶನದ 'ಪ್ರೀತಿ ಏಕೆ ಭೂಮಿ ಮೇಲಿದೆ' ಚಿತ್ರದಲ್ಲಿ ಬಾಲಿವುಡ್ ನ ಮೇರು ಗಾಯಕಿ ಲತಾ ಮ೦ಗೇಶ್ಕರ್ ಹಾಡಲಿರುವುದು ಭಾರಿ ಸುದ್ದಿಯಾಯಿತು. ಹಾಡುತ್ತಾರೋ ಇಲ್ಲವೋ ಅನ್ನುವುದು ಚಿತ್ರದ ಧ್ವನಿ ಸುರುಳಿ ಬಿಡುಗಡೆಯಾದಾಗ ಖಾತ್ರಿಯಾಗಬಹುದು. New dawn in world cricket !? Finally Australians have done it. ICC Champion's Trophy (previously called ICC Knock Out trophy) was one major one day tournament where they had not made a mark. But with this win they have broken the jinx of not performing well in this prestigious tournament regarded as the major one day tournament next only to world cup. For the enthusiasts this was their 31st major title in ODIs. ICC Knock Out/ Champion's trophy was started way back in 1998 in Dhaka, Bangladesh and is being played every 2 years. But then Australia was blasted out of the tournament almost single handedly by Sachin Tendulkar. There was no concept of groups at that time in this tournament. You lose the match and you are out of the tournament. South Africa claimed the title outsmarting West Indies in the final. Then again in the year 2000 in Kenya, Australia was outplayed by India this time with new stars Zaheer Khan and Yuvraj Singh. Though India managed to get into finals beating South Africa in the semi finals they lost to the New Zealanders in the final. In 2002 played in Sri Lanka rain played the major role in majority of the matches with India and Sri Lanka being declared as joint winners. In 2004 when it was played in England to everybody's surprise West Indies emerged winners defeating England which won semifinals against the mighty Aussies at that time. Ironically this time in 2006 the defending champions Windies had to play the qualifying matches in this tournament to enter the group stage. Australia's campaign this time was not so good with them losing to West Indies in their first match. But then Aussies are Aussies. They could turn around things in no time. They then went on winning their next 2 matches against England and India comfortably. In the semi finals against arch rivals New Zealand they had the opposition on the mat with New Zealand reeling at 35/6 chasing a target of 241. But then Australia too had their anxious moments when Daniel Vettori and Jacob Oram put on 103 runs for the 7th wicket. In the end Australia managed to win the match by 34 runs. On the other side West Indies recorded their victory in style with Chris Gayle scoring 133 not out and defeating South Africa by 6 wickets. the final between Australia and West Indies proved to be an anti-climax. With the kind of start Chris Gayle and Chanderpaul provided one would have expected them to amass over 350 runs. What with Australian spear head Glen McGrath being hit for 22 runs in 2 overs with two towering sixes by Gayle this was certainly the case. McGrath shaking his head after being hit was very very rare these days. But to the dismay of Windies and relief of Aussies the great West Indian collapse was just around the corner. But it started too early that day. Over dependence of the team on Gayle was proved once again in Mumbai and Australians staged a remarkable comeback by bundling out WI for paltry 138. Aussies achieved the revised target due to rain of 116 runs from 35 overs with 8 wickets in hand. West Indian collapse is not new. To instantiate it in this tournament, it was bundled out for over 80 runs in league match against Sri Lanka. Against India in the group match it had a mini collapse when hardly 20 runs left to reach the target. But then having won the league match against Aussies one expected much more from them. Australian road to victory reminded of their 1999 world cup victory when they started their campaign losing their first match to arch rivals New Zealand. With hardly 4 months to go for the world cup in West Indies, one of the favourites other than Aussies is Windies. They had now clashed with Australia twice in succession in finals having defeated them in league stages. Whatever may be argument but clearly West Indies have shown the world how to beat the invincible Aussies twice. With the current form of other teams it seems that with familiar conditions in West Indies and home advantage West Indies too are strong contenders for the prized trophy. Will the golden days of West Indies return? We will have to wait another 4 months to get the exact answer for this question. Suddenly it is a trend catching up with the film makers in Mumbai. The age of remakes is now here. Devdas, Don, Umrao Jaan, Sholey and the list goes on. Though the box office results of these 'remade' films are not so encouraging still the experiments are going on. Remade films are the flavour of the season with those extravagant sets and costumes overshadowing their original. But when a film is remade, the comparisions between the original and the remade is inevitable. And the result is that the newer one fails to impress the critics and even the audience to some extent (if they had seen the original earlier) in most occasions. Younger generation may be thrilled to see their favourite hero in a new role. But not for those who had seen the original. When I saw Don a week ago this was the case since I had seen the original Amitabh starrer. One has to be careful when choosing the leads for their remade version as today most of the actors in Bollywood are stereotyped for their typical roles. So it is hard to accept Shah Rukh as Don in place of Amitabh as SRK is most known for his romantic roles. Generally the films in an era are inspired by the socio-economic condition of the nation at that time. So can you imagine a movie like Coolie which starred angry man of that time Amitabh remade today? At that time nation was in the phase of industrialization and labour unions. So the film suited those circumstances and was well appreciated. But not now. Next in the pipeline of remade films is Sholey. Dont know how the audience will accept this seemingly misadventure with Big B who played Jai in the original playing the bad man Gabbar Singh here!! This week released Umrao Jaan also met with the same fate as other remakes with critics. In the case of remakes with the plot already known to the viewers the film cast is under severe inspection as there is a comparision between the two versions. In my opinion when you are about to make a remake it should be a basic idea from the original with the film story relevant to today's scenario. With the media blowing the remade films out of proportion naturally the expectations are also high. Atleast till the movie is released film makers should not reveal it as a remake. But there is a catch here, you are about get to lot of publicity and hype if it is a projected as a remake right from day one. So there is a thin line between the two. So it should be a fine balance between retaining your fresh ideas, not merely copying from the original and living up to the expectations. As they say rather than remake, 'inspiration' is a better word. But one question still remains unanswered. Does the era of remakes indicate the absence of fresh ideas? This is the question that is yet to be answered by the filmmakers. Mr.Amitabh Bachchan is now Dr.Amitabh Bachchan with the Delhi University awarding him honorary doctorate. Congratulations Dr.Amitabh Bachchan. ಸಮಸ್ತ ಕನ್ನಡಿಗರಿಗೆ ಸುವರ್ಣ ಕನ್ನಡ ರಾಜ್ಯೋತ್ಸವದ ಶುಭಾಶಯಗಳು. ಅ೦ತರ್ಜಾಲದಲ್ಲಿ ಕನ್ನಡದಲ್ಲಿ ಲೇಖನ ಬರೆಯಬೇಕೆ೦ಬ ಬಹುದಿನಗಳ ಬಯಕೆ ಇ೦ದು ಕೈಗೂಡುತ್ತಿದೆ. ಈ ಮೊದಲು ಕರ್ನಾಟಕದ ೫೦ರ ಸ೦ಭ್ರಮದ ಬಗ್ಗೆ ಆ೦ಗ್ಲ ಭಾಷೆಯಲ್ಲಿ ಒ೦ದು ಲೇಖನ ಬರೆದಿದ್ದೆ. ಆದರೆ ನಮ್ಮ ನಾಡಿನ ಬಗ್ಗೆ ನಮ್ಮ ಭಾಷೆಯಲ್ಲಿ ಬರೆಯುವ ಅನುಭವವೇ ಬೇರೆ. ಕನ್ನಡ ನಾಡೆ೦ದಾಗ ಮೊದಲು ನೆನಪಿಗೆ ಬರುವುದು ರಾಷ್ಟ್ರಕವಿ ಕುವೆ೦ಪು ವಿರಚಿತ 'ಜೈ ಭಾರತ ಜನನಿಯ ತನುಜಾತೆ, ಜಯ ಹೇ ಕರ್ನಾಟಕ ಮಾತೆ'. ಕನ್ನಡ ಮಾಧ್ಯಮದಲ್ಲಿ ಪ್ರಾಥಮಿಕ ಶಿಕ್ಷಣ ಪಡೆದವರಿಗೆ ಶಾಲೆಯ ಬೆಳಗಿನ ಪ್ರಾರ್ಥನೆಯಲ್ಲಿ ಹಾಡಿ ನಮ್ಮ ನಾಡಗೀತೆಯು ಕ೦ಠಪಾಠವಾಗಿರಬಹುದು. ರಾಷ್ಟ್ರಕ್ಕೆ 'ಜನಗಣಮನ' ಹೇಗೊ ಹಾಗೇಯೆ ನಾಡಗೀತೆಯು ನಮ್ಮ ನಾಡಪ್ರೇಮವನ್ನು ಜಾಗೃತಗೊಳಿಸುತ್ತದೆ ಎ೦ದರೆ ತಪ್ಪಾಗಲಾರದು. ಸಾಮಾನ್ಯವಾಗಿ ರಾಷ್ಟ್ರ, ರಾಜ್ಯದ ಬಗ್ಗೆ ಅರಿವಾಗುವುದು ಈ ಪ್ರಾಥಮಿಕ ಶಿಕ್ಷಣದ ಹಂತದಲ್ಲೇ. ನಾನು ಓದುತ್ತಿರುವಾಗ ಸಮಾಜ ಅಧ್ಯಯನದಲ್ಲಿ ಕರ್ನಾಟಕದ ಬಗ್ಗೆ ಇದ್ದ ಪ್ರತ್ಯೇಕವಾದ ಪುಸ್ತಕದಲ್ಲಿ ಸಾಕಷ್ಟು ಮಾಹಿತಿ ಇತ್ತು - ಜಿಲ್ಲೆಗಳ ಬಗ್ಗೆ, ಕರ್ನಾಟಕದ ಬೆಳೆಗಳು, ಖನಿಜ ಸ೦ಪತ್ತು, ಪ್ರವಾಸಿ ತಾಣಗಳು ಹೀಗೆ ನಾಡಿನ ಸಮಗ್ರ ಚಿತ್ರಣವಿತ್ತು. ಹೀಗೆ ಬೆಳೆದು ಬಂದ ನಾಡಪ್ರೇಮ ಇ೦ದೂ ಹಸಿರಾಗಿದೆ. ಒ೦ದು ನಾಡು ಎ೦ದಾಗ ಅಲ್ಲಿನ ಸ೦ಸ್ಕೃತಿ, ಸಾಹಿತ್ಯ, ಜನ ಎಲ್ಲವೂ ಮುಖ್ಯವಾಗುತ್ತವೆ. ಈ ಐವತ್ತು ವರ್ಷಗಳಲ್ಲಿ ಕನ್ನಡ ಸಾಹಿತ್ಯ ಪ್ರಪ೦ಚವನ್ನು ಅವಲೋಕಿಸಿದರೆ ಅಲ್ಲಿ ನಮ್ಮ ಸಾಧನೆ ಎದ್ದು ಕಾಣುತ್ತದೆ. ಭಾರತೀಯ ಭಾಷೆಗಳಲ್ಲಿ ಅತಿ ಹೆಚ್ಚು ಅ೦ದರೆ ೭ ಜ್ನಾನಪೀಠ ಪ್ರಶಸ್ತಿಗಳನ್ನು ಪಡೆದುಕೊ೦ಡಿರುವ ಕನ್ನಡ ಸಾಹಿತಿಗಳ ಸಾಧನೆ ಶ್ಲಾಘನೀಯ(ಕನ್ನಡ ಬಿಟ್ಟರೆ ಹಿಂದಿ ಮಾತ್ರ ಈ ಸಾಧನೆಯನ್ನು ಮಾಡಿದೆ). ಕನ್ನಡದ ೪೯ ಮ೦ದಿ ಸಾಹಿತಿಗಳಿಗೆ ಕೇ೦ದ್ರ ಸಾಹಿತ್ಯ ಅಕಾಡೆಮಿ ಪ್ರಶಸ್ತಿ ಲಭಿಸಿದೆ. ಕರ್ನಾಟಕದ ಏಕೀಕರಣಕ್ಕೆ ಕನ್ನಡ ಸಾಹಿತಿಗಳ, ಕವಿಗಳ ಕೊಡುಗೆ ಅಪಾರ. ಏಕೀಕರಣದ ಸ೦ದರ್ಭದಲ್ಲಿ ಹುಯಿಲಗೋಳ ನಾರಾಯಣರಾಯರ 'ಉದಯವಾಗಲಿ ನಮ್ಮ ಚೆಲುವ ಕನ್ನಡ ನಾಡು' ಕವನ ಜನರಿಗೆ ಸ್ಫೂರ್ತಿಯಾದದ್ದನ್ನು ನಾವೆ೦ದಿಗೂ ಮರೆಯುವ೦ತಿಲ್ಲ. ಜಾನಪದ ಕಲೆಗಳು ಈಗಿನ ಮಾಹಿತಿ ತ೦ತ್ರಜ್ನಾನ ಯುಗದಲ್ಲಿ ಕಳೆದುಹೋಗುತ್ತಿವೆ ಎನ್ನುವ ಸ೦ದರ್ಭದಲ್ಲಿ ಕೆಲವು ತಿ೦ಗಳ ಹಿ೦ದೆ ಆರ೦ಭಗೊ೦ಡ ರಾಜ್ಯ ಸರಕಾರದ 'ಜಾನಪದ ಜಾತ್ರೆ' ಯೋಜನೆ ಒ೦ದು ಉತ್ತಮ ಹೆಜ್ಜೆ. ಇನ್ನು ಕನ್ನಡ ಚಿತ್ರರ೦ಗದತ್ತ ಕಣ್ಣು ಹಾಯಿಸಿದರೆ ಬೆಳವಣಿಗೆ ಕು೦ಠಿತವಾಗಿದೆ ಎನ್ನಬಹುದು. ಪರಭಾಷಾ ಮರುನಿರ್ಮಿತ ಚಿತ್ರಗಳಿ೦ದ ತು೦ಬಿಕೊ೦ಡ೦ತಿದೆ. ಕನ್ನಡದಲ್ಲಿ ಕಥೆಗಳಿಲ್ಲವೆ೦ಬ ಆರೋಪದಲ್ಲಿ ಹುರುಳಿಲ್ಲ. ಶ್ರೀಮ೦ತ ಕನ್ನಡ ಸಾಹಿತ್ಯವೇ ಚಿತ್ರರ೦ಗಕ್ಕೆ ಸ್ಫೂರ್ತಿ ಯಾಕಾಗಬಾರದು? ಯಥಾವತ್ತಾಗಲ್ಲದಿದ್ದರೂ ಚಿತ್ರರ೦ಗಕ್ಕೆ ಮಾರ್ಪಾಟು ಮಾಡಿಕೊ೦ಡು ಕಥೆಗಳನ್ನು ಹೆಣೆಯಬಹುದು. ಬಹುಶಃ ಪುಟ್ಟಣ್ಣ ಕಣಗಾಲರ ನ೦ತರ ಕನ್ನಡದಲ್ಲಿ ಅವರಷ್ಟು ಪ್ರತಿಭಾನ್ವಿತ ನಿರ್ದೇಶಕರೇ ಬರಲಿಲ್ಲ ಅನ್ನಬಹುದು. ಕನ್ನಡ ನಾಡಿನ ಈ ೫೦ರ ಸ೦ಭ್ರಮದ ಈ ವರ್ಷದಲ್ಲಿ ನಾಡಿನ ಆರಾಧ್ಯ ದೈವ ವರನಟ ಡಾ||ರಾಜ್ ನಮ್ಮನಗಲಿದ್ದು ಬಹಳ ಖೇದಕರ. ಅವರು ಹಾಡಿದ 'ಹುಟ್ಟಿದರೆ ಕನ್ನಡ ನಾಡಲ್ಲಿ ಹುಟ್ಟಬೇಕು' ಹಾಡು ನಾಡಗೀತೆಯಷ್ಟೇ ಜನಪ್ರಿಯವಾದದ್ದನ್ನು ಇಲ್ಲಿ ಸ್ಮರಿಸಬಹುದು. ಈ ೫೦ ವರ್ಷಗಳಲ್ಲಿ ಕರ್ನಾಟಕದ ಸಾಧನೆಗಳು ಹೀಗಿವೆ: ಸಾಕ್ಷರತಾ ಪ್ರಮಾಣ ಶೇಕಡಾ ೨೪ರಿ೦ದ ಶೇಕಡಾ ೭೧ಕ್ಕೆ ಏರಿದೆ. ಇನ್ನು ೧೦೦ ಶೇಕಡಾ ಸಾಕ್ಷರತೆ ಮು೦ದಿನ ಗುರಿಯಾಗಬೇಕು. ರಾಷ್ಟ್ರದಲ್ಲೇ ಪ್ರಪ್ರಥಮವಾಗಿ 'ಉಳುವವನಿಗೆ ಭೂಮಿ' ಕಾಯ್ದೆಯನ್ನು ಜಾರಿಗೊಳಿಸಿದ ರಾಜ್ಯ ನಮ್ಮದು. ಮಾಹಿತಿ ತ೦ತ್ರಜ್ನಾನದ ಈ ಯುಗದಲ್ಲಿ ಅದಕ್ಕೆ ಅನುಗುಣವಾಗಿ ಭೂ ವ್ಯವಹಾರದ ಲೆಕ್ಕಪತ್ರಗಳನ್ನು ಗಣಕೀಕರಿಸಿದ ಸರಕಾರದ 'ಭೂಮಿ' ಯೋಜನೆ ರಾಷ್ಟ್ರದಲ್ಲಷ್ಟೇ ಅಲ್ಲದೆ ಅ೦ತರಾಷ್ಟ್ರೀಯ ಮಟ್ಟದಲ್ಲೂ ಪ್ರಶ೦ಸೆ ಗಳಿಸಿದೆ. ಇನ್ನು ಕೈಗಾರಿಕಾ ಪ್ರಗತಿಯನ್ನು ಅವಲೋಕಿಸಿದರೆ ಮಿಶ್ರ ಪ್ರತಿಕ್ರಿಯೆ ಇದೆ. ಮಾಹಿತಿ ತ೦ತ್ರಜ್ನಾನ ಕ್ಷೇತ್ರದಲ್ಲಿ ಕರ್ನಾಟಕದ ಸಾಧನೆ ಅಪಾರ. ಪ್ರಧಾನಿ ಮನ್ ಮೋಹನ್ ಸಿ೦ಗ್ ಉದ್ಗರಿಸಿದ೦ತೆ ವಿಶ್ವಕ್ಕೆ ಭಾರತಕ್ಕಿ೦ತ ಹೆಚ್ಚಾಗಿ ಬೆ೦ಗಳೂರಿನ ಪರಿಚಯವಿದೆ. ಆದರೆ ಉದ್ಯೋಗವಕಾಶಗಳ ದೃಷ್ಟಿಯಿ೦ದ ರಾಜಧಾನಿ ಬೆ೦ಗಳೂರಿಗೆ ಪರ್ಯಾಯವಾಗಿ ಒ೦ದು ನಗರವನ್ನು ಬೆಳೆಸಲಾಗದಿದ್ದುದು ವಿಪರ್ಯಾಸ. ಈಗೀಗ ಮಾಹಿತಿ ತ೦ತ್ರಜ್ನಾನದ ಕ್ರಾ೦ತಿ ರಾಜ್ಯದ ಇತರೆ ನಗರಗಳಾದ ಮ೦ಗಳೂರು, ಮೈಸೂರು, ಹುಬ್ಬಳ್ಳಿ, ಬೆಳಗಾವಿಗಳಿಗೆ ಹಬ್ಬುತ್ತಿರುವುದು ಸ೦ತಸಕರ ಬೆಳವಣಿಗೆ. ಇದು ಬೇರೆ ಔದ್ಯೋಗಿಕ ಕ್ಷೇತ್ರಗಳಲ್ಲೂ ಮು೦ದುವರಿದರೆ ಬೆ೦ಗಳೂರು ಮೇಲಿನ ಒತ್ತಡ ತಗ್ಗುವುದರಲ್ಲಿ ಸ೦ಶಯವಿಲ್ಲ. ಕರ್ನಾಟಕದ ಪ್ರವಾಸಿ ತಾಣಗಳು ಅಪಾರ. ಭೌಗೋಳಿಕವಾಗಿ ಕರ್ನಾಟಕವು ವೈವಿಧ್ಯತೆಗಳಿ೦ದ ತು೦ಬಿದೆ. ಮಲೆನಾಡು, ಬಯಲು ಪ್ರದೇಶ, ಪಶ್ಚಿಮ ಘಟ್ಟಗಳು, ಕರಾವಳಿ ಹೀಗೆ ಪಟ್ಟಿ ಬೆಳೆಯುತ್ತದೆ. ನಮ್ಮಲ್ಲಿರುವ ಚಾಲುಕ್ಯ, ಹೊಯ್ಸಳ, ವಿಜಯನಗರ ಶೈಲಿಯ ದೇವಾಲಯಗಳು, ಪಶ್ಚಿಮ ಘಟ್ಟಗಳ ನಿಸರ್ಗ ಧಾಮಗಳು, ಜಲಪಾತಗಳು, ಕರಾವಳಿಯ ಕಡಲ ತೀರಗಳು - ಇವುಗಳ ಬಗ್ಗೆ ಹೊರ ಪ್ರಪ೦ಚಕ್ಕೆ ಸರಿಯಾದ ಪ್ರಚಾರ ನೀಡಿದರೆ ನೆರೆ ರಾಜ್ಯಗಳಾದ ಕೇರಳ, ಗೋವಾಗಳ೦ತೆ ಪ್ರವಾಸಿಗರು ಆಕರ್ಷಿತರಾಗುವುದಲ್ಲಿ ಸ೦ದೇಹವೇ ಇಲ್ಲ. ಈ ನಿಟ್ಟಿನಲ್ಲಿ ಸರಕಾರ ಕಾರ್ಯೋನ್ಮುಖವಾಗಬೇಕು. ನಮ್ಮ ಭಾಷೆ ನಮ್ಮ ನಾಡಿನ, ನಮ್ಮ ಜನರ ಸ್ವಾಭಿಮಾನದ ಸ೦ಕೇತ. ಜಾಗತೀಕರಣದ ಈ ಯುಗದಲ್ಲಿ ನಮ್ಮ ಭಾಷೆಯನ್ನು ಉಳಿಸಿ, ಬೆಳೆಸುವ ಜವಾಬ್ದಾರಿ ನಮ್ಮ ನಿಮ್ಮೆಲ್ಲರದು. ಕೇವಲ ನವೆ೦ಬರ್ ಕನ್ನಡಿಗರಾಗದೆ ವರ್ಷಪೂರ್ತಿ ಕನ್ನಡ ಬಳಸಿ, ಬೆಳೆಸಿ. ಕುವೆ೦ಪುರವರ೦ದ೦ತೆ 'ಕನ್ನಡಕ್ಕಾಗಿ ಕೈ ಎತ್ತು, ನಿನ್ನ ಕೈ ಕಲ್ಪವೃಕ್ಷವಾಗುತ್ತದೆ'. ಕೊನೆಯದಾಗಿ ನಾನು ಹೇಳಬಯಸುವುದೇನ೦ದರೆ ಮಾಹಿತಿ ತ೦ತ್ರಜ್ನಾನದ ಪ್ರಗತಿಯ ಉಪಯೋಗ ಹೆಚ್ಚಾಗಿ ವಿದೇಶಗಳಿಗೆ ಆಗುತ್ತಿವೆ. ನಮ್ಮ ನಾಡಿಗೂ ಇದರ ಲಾಭ ದೊರಕಬೇಕು. ಮು೦ದೊ೦ದು ದಿನ ಈಗ ಬೆ೦ಗಳೂರಿನಿ೦ದ ಯಾವ ಮಾಹಿತಿ ತ೦ತ್ರಜ್ನಾನ ಸೇವೆಗಳು ವಿದೇಶಿ ಗ್ರಾಹಕರಿಗೆ ದೊರಕುತ್ತಿವೆಯೋ ಅವು ನಮಗೂ ಅಗತ್ಯವಾಗಬಹುದು. ಆ ದಿನಕ್ಕೆ ನಾವು ಇ೦ದಿನಿ೦ದಲೇ ಸಿದ್ಧರಾಗಿರುವುದು ಒಳಿತು. ಏನ೦ತೀರ? Continuing the discussion on the previous post about FM Channels now we land up where we have got game shows on FM Radios. Though the amount may not be as large as it used to be in TV game shows like 'Kaun Banega Carodpathi?' or popularly called 'KBC' of Star Plus or 'Jeetho Chappad Phad Ke' of Sony but surely they are here to stay. In Bangalore, Radio Big 92.7 has started 'Lucky Lakshmi' few day back hosted by veteran RJ Kiran Shridhar making a come back in FM Radio after a long gap, Radio One 94.3 offers its listeners to become 'Lakhpathis' daily by answering their 3 questions, Radio City 91 FM went one step more with it offering a flat in National Capital New Delhi for the contest winners. So its raining prize galore this season in Bangalore by the radio bigwigs. As my friend Nidhi pointed out in a post in his blog about the SMSes playing a lead role in earning revenue both for sponsors and the event organisers in almost every game show nowadays it continue to do so here also. Talking more of FM Radios, November 1 marks the entry of one more famous media person into FM Radio Space with Ravi Belagere beginning to host a new programme at 8 am in FM Rainbow 101.3 called 'Ravi Belagere at 8 am'. And the punch line of the programme goes in typical Belagere style 'Karnatakada gentlemengala madhye obba gantle-man'. Among the loud voices of all private FM channels in Bangalore now FM Rainbow's voice is hardly heard. Will this move change its fortunes? Lets wait and watch. On the other front, BMTC in Bangalore has introduced new buses exclusive for BMTC pass holders called the 'Pass Bus' thus justifying the need for single door buses in Bangalore. BMTC has taken several good initiatives this year with it starting the much awaited Volvo Service, and then came Special Mall Bus(to visit all the malls in Bangalore), Hospital Special Bus, Women's Special Bus. Kudos to BMTC. Keep up the good work. Watch this space in the coming days for new posts. Latest addition to the growing number FM channels in Bangalore is Radio Big 92.7 FM. Launched on Friday, 06th October 2006, it has already arrived big with Kannada superstar Upendra being its brand ambassador. That takes the count of most listened FM channels in Bangalore to 7. Here is the brief overview of these channels. Radio City 91 FM : This was the first private FM channel, started in 2001 in Bangalore. For the first 5 years it was the undisputed leader in FM space with large number of radio audience so much so that FM radio in Bangalore meant Radio City 91 FM. Programmes here are mostly in English with predominently Hindi and occasionally Kannada songs being played. Radio Mirchi 98.3 FM : First FM channel to enter Bangalore after central govt's phase II expansion of FM channels. Started this year with Kanglish tag line 'sakkath hot maga' with similar tag lines in other cities as well such as Chennai and Hyderabad. Programmes are in Kannada rather Kanglish with mix of Hindi and Kannada songs being played. Channel is promoted by the well known media giant Times Group. Radio One 94.3 FM : A Mid-Day group channel started this year with the tag line 'hit mele hit mele hit'. Programmes in Kanglish with a good mix of Hindi and Kannada songs being played. Radio Indigo 91.9 FM : Launched about a month ago here in Bangalore, a Jupiter Capital venture, this is the channel dedicated to English songs rather international music with programmes RJ'ed in English. Radio Big 92.7 FM : Started few days ago, already made its presence felt. It is a channel from the Adlabs group, which has already announced that it is going to launch in 45 Indian cities in the coming days. In Karnataka, Mangalore and Mysore are on its next venture. Programmes mostly in Kannada less in Kanglish with predominently Kannada songs and Hindi songs being played. Occasionally it airs Telugu and Tamil songs too. AIR FM Rainbow 101.3 FM : Govt owned FM channel under the umbrella of All India Radio(AIR). Programmes in Kannada with mostly Kannada and Hindi songs being played. One thing that has not changed in the case of Govt FM channels compared to the AM version is the news updates. Frankly speaking no other private radio station provides you with news updates except occasional updates on cricket scores. AIR Vividh Bharati 102.9 FM : One more AIR channel with programmes in Kannada as well as in Hindi and a mix of Kannada and Hindi songs being played. Similar on the lines of FM Rainbow it also airs regular news updates. Apart from the FM channels listed above there are some more govt owned FM channels probably you have not heard of. They are on frequencies 100.1 FM and 107.6 FM. 101.1 FM is a AIR classical music channel known as 'Amrutha Varshini' and you have 'Gyan Vani' on 107.6 FM. Gyan Vani as the name suggests airs lectures, interviews dealing with education, health, science etc. This is not the end of radio boom in Bangalore. There is still more with another 4 FM channels on their way to the silicon valley of India. Thanks to the phase II expansion of private FM channels by the central government, tier II cities too witnessing a radio boom. In Karnataka, Mangalore is going to get 4 private FM channels in the near future. These four channels are Kal Radio of Sun Group, Adlabs, ENIL of the Radio Mirchi group and Century Radio. Similarly you will have FM radio stations being set up in Mysore, Hubli, Gulbarga, Belgaum. With these developments the listener now has a lot of radio stations to choose from. Can we call it a radio revolution in Bangalore? Sure. Put on your thoughts on this topic by sending your comments. Though started in 1994, blogs became popular in the new millenium .i.e in the 2000s atleast in India. Now bloggers are enjoying the status being the new age journalists. According to blogherald.com, there were 70 million blogs in July 2006 with Indian blogs being approximately 100,000. And this number continues to grow. From being personal diaries to professional write-ups, blogs have come a long way. Google has seperate search page dedicated for blog search http://blogsearch.google.com/. You have blogs of almost every type - diaries, professional articles, sports, technical articles and reviews, film reviews, product reviews. Unlike traditional journalism, here you have no restrictions in publishing your views (unless you are posting on some news paper's or news channel's site) giving you more liberty and power. But as they say, with great power comes great responsibilities. So you are your own judge when publishing your posts on the net. Fed up with the reading of film reviews with all their jargon by critics in news papers every weekend then you have now one new avenue to ponder upon. Film reviews in blogs. One of my friends Sandeep has a blog mostly dedicated to film reviews. I did write a film review on Lage Raho Munna Bhai few weeks back. And there are bloggers whose blogs are dedicated only to film reviews. Cricket is one obsession with us Indians. So there are blogs dedicated only to cricket articles. Some of my earlier articles on cricket include Historic Win of India in West Indies, Cricket in the time of Football, Talking Cricket. Not only text, but also you will find pictures and videos embedded in the blog. Some of the blogs are dedicated only to picture/photos or videos. Technical reviews are a biggest plus came out of blogging. Amit Agarwal's blog is sure a techie's delight as he carries you through the exciting world of Technology with his tips and reviews on latest technology and products. Compared to traditional journalism I think, here you will find less dedicated readers. And you have to retain your regular readers and if you are a blogger and not updating the blog regularly then you are likely to lose your dedicated readers. Big names in the media like NDTV, CNN-IBN are providing the netizens with the chance of posting their write-ups on their websites by providing the blog service, shows the importance of blogs in this era. Recently CNN-IBN's Citizen Journalist initiative was well appreciated and it made the channel/ibnlive.com site popular among net users. Though live news (as in news paper, news channel web sites) is still not in the domain of the bloggers it is catching up slowly. And that by itself does not constitute journalism. Other areas like public opinion, reviews, articles, debates(as it happens through the exchange of comments between the author and readers of the blog) have been strong hold of the bloggers. Blogging community continues to grow and it will shape the things in the future is no understatement. Post to read: Came across a post in Saurabh Saksena's blog titled 'In search of Indianness abroad'. Worth reading. Jai bharatha jananiya thanujaathe, Jaya hey Karnataka Maathe. Karnataka turns 50 this year, so golden jubilee celebrations are on. On November 1, 1956 state of Karnataka was formed though it was called Mysore state till 1973. So now it is a good time to look at how the state progressed in the last 50 years. Karnataka was formed in the year 1956 comprising of princely state of Mysore and areas held under Bombay, Madras presidencies and areas of princely state of Hyderabad, which even today is called Hyderabad Karnataka. Great men who championed the cause of unification of Karnataka include Alur Venkata Rao, Goruru Ramaswamy Iyengar, S. Nijalingappa and Kengal Hanumantiah. Huyilugola Narayana Rao’s poem Udayavaagali Namma Cheluva Kannada Naadu worth mention here. Though known now for it’s IT and BT, Karnataka is unique compared to other states in India, it is the only state, which exports sandalwood in India. Karnataka is the largest producer of coffee, raw silk and sandalwood based products in India. Three-fourth of the Indian floriculture industry is based in Karnataka. Brighter aspects of progress of the state include IT boom in Bangalore started in the mid 90s, and now slowly spreading to tier II cities like Mangalore, Mysore and Hubli. One good aspect of this IT revolution was the boom in setting up Engineering Colleges in the state. But unlike other states it has not a developed city to be called next Bangalore till now. Mysore becoming next Bangalore is a long wait and I see it only in terms of IT industry. As per my observations other states have developed other industrial center to provide job opportunities other than state capital – say in Kerala(capital – Thiruvanthapuram), there is Kochi, in Tamil Nadu(capital – Chennai), there is Coimbatore, in Andhra Pradesh(capital – Hyderabad), there is Vishakhapattanam and in Maharashtra(capital – Mumbai), there is Pune. Now with Bangalore becoming victim of its own development there is an urgent need to shift focus to other cities in Karnataka to create an alternative to Bangalore. As Sir M Vishveshvaraiaha told long back ‘Industrialize or Perish’ is the need of the hour. Of course, in this direction lot of right steps have been taken to set up various industrial parks to be set in various centers and establishing airports in prominent district centers and encouraging MNCs to set shop in tier II cities. Right steps in the right directions. Another industry which needs a boost is the tourism industry. With the kind of geography Karnataka has one wonders where it lost the race to neighboring Kerala and Goa. Karnataka can be good tourist destination if it is projected properly. Chalukya, Hoysala, Rashtrakuta and Vijayanagar temples are sure a tourist’s delight. It is not that now tourists don’t visit here but it can draw big number of tourists if properly projected. Another area which was never explored is Coastal Karnataka. Maravanthe, Kapu, Ullala Surathkal beaches, St. Mary’s Island can be made good tourist spots. Dasara season is nearing. Mysore is all set to host the grand event. Wish you all a Suvarna Karnataka Varsha and a Happy Dasara. Talking Cricket . . .
Cricket season is back again. But again haunted by rains. Anyway that is part and parcel of the game. Its been long time before I wrote anything about cricket. So back to square one. Cricket commentary is one thing which sets apart this gentleman's game from rest of the sports. Every ardent fan of cricket is sure to have fascinated by the words of commentator. In an era when TVs were a luxury, cricket commentry on radio or shall I say transistors was the only source of instant info on cricket. Its not just the on-field action which gives colour to this game, but also these band of gentlemen who with their words arouse the interest in a loosing game too. To name a few: Ravi Shastri, Geoffrey Boycott,Tony Greig, Harsha Bhogle and off late Navjot Singh Sidhu. For the curious bunch here is a list though not complete. It is these people who add spice to the rather boring play of test matches or one-sided encounters of ODIs with their stories, comparisions and anecdotes. Talking about cricket commentators, I think undoubtedly Ravi Shastri is the best ever commentator from India, closely followed by another veteran Harsha Bhogle. Not only commentary but also the post-match presentation is well handled by him, whether it be speaking on the occasion or asking questions with the captains of both teams in play. Phrases like 'margin of error is minimal on this pitch' or style of saying score of 101 as one-o-one have a mark of Ravi Shastri on that. Another good thing about Ravi Shastri is his control over his talk and presence of mind. For an instance, once Ravi Shastri had commented 'Good Shot' when a batsman hit aerial shot on the on-side. But it landed safely in the hands of long-on. Then he changed his comment as 'Infact too good'. Nowadays you can find his shades in Ramiz Raja's commentary. Harsha Bhogle's comments have a lot of research and analysis in it. Amazing for an IIM guy who had no background in cricket to become one of the best commentators in the game. When it comes to speaking the language of the common man in commentry box, nobody can beat Navjot Singh Sidhu. Look at some his comments : 'That ball went so high it could have got an air hostess down with it', 'Experience is like a comb that life gives you when you are bald', 'The cat with gloves catches no mice'. No doubt, he has made a name for himself with his 'Sidhuisms'. Coming to English commentators, Tony Greig and Geoffrey Boycott are unique with their British accent. Dont know who among the two pronounces 'crickeeet' for cricket. Boycott's comment on Sourav Ganguly as 'God of off-side' can be remembered here. On the other side there are commentators who take the interest away from the game with their boring and slow-paced commentry. One of them would be Sanjay Manjrekar. No enthusiasm in his commentary. Michael Holding's commentary makes us difficult to understand his accent. With the sports channels increasing this breed continue to increase with their own style of commentary. Lastly, a familiar scene after a coin is tossed in the middle of the pitch used to be Ravi Shastri invariably asking whenever Sourav Ganguly lost the toss 'Disappointed with the toss?' and Sourav invariably replying 'No, Not really'. One good thing about following cricket commentary is the exposure you get to the vast vocabulary of English. In my opinion, if you want to learn Hindi watch Bollywood movies and for a better English follow cricket commentary. Your opinion may differ. Bole tho ek dum jhakkas. September 11, 2006 marks the 100th anniversary of Satyagraha started by Mahatma Gandhiji in South Africa way back in 1906. So this film Lage Raho Munna Bhai comes at a right juncture to remind all of us of the long forgotten Gandhiyan principles of Truth and Non-voilence. Interestingly, this film is not a sequel to the earlier Munna Bhai MBBS as many of us thought. Other sequel released this year was Phir Herapheri, sequel of Herapheri, which was not up to the mark set by its prequel as it is the case with most of the sequels. One more sequel was Krrish, sequel to hugely hit Koi Mil Gaya. But this film Lage Raho Munna Bhai breaks the jinx that sequels do not perform well than its prequel(Ironically it is not a sequel and only the concept in the prequel has been carry forwarded). Here the Bhai with a golden heart comes in a new avtaar of history professor. If it was healing doctor Munna in Munna Bhai MBBS, here he is preaching Satya aur Ahimsa, in the footsteps of Mahatma. The plot starts with the kidnapping of the Corporation official much in the same light as in Munna Bhai MBBS, but with a different plan. Well begun is half done. Thab se shuru hotha hai dil kholke hasne ka silsila jo film ke aakhir thak chaltha rehtha hai. If you are convinced that Munna Bhai MBBS was the best comedy film ever made in Mumbai, think again, Lage Raho Munna Bhai(LRMB) is set to break all the records. As with the other big budget films of the year LRMB boosted of first several shows in Mumbai being entirely booked before the release itself. So I take pride in the fact that I saw the movie two days after release i.e on Sunday itself. Story unfolds as Munna is in love with the RJ Jahnvi (Good Mornnnnnning Mumbai, as she greets her audience every morning). Munna wins the quiz organized by the Radio Channel on October 2 based on Mahatma with the help of the professors caught by him and gets a chance to meet Jahnvi and go on air. Again for the professors he has prizes if they answer the questions first. There in the studio he introduces himself as professor of history. So he is invited by Jahnvi to her home to give lecture on Mahatma. Munna now goes to Gandhi Library to study about Mahatma and gets into chemical locha to see the Mahatma everywhere in Mumbai and what follows after that is a tale of Munna walking on the footsteps of Mahatma. There is never a dull moment in the film. To be frank you may miss some of the jokes cracked when you start laughing for the first one. Such is the impact that the whole theatre will be indulged in laugh riot. Film tells the principles of truth and non-voilence in a much acceptable manner. Be it be the confession of Munna to Jhanvi or the facing bribe problem in a govt office by retired teacher or the problem with the neighbour's nuisances. Worth a watch for every film goer. I am now planning to go for this movie for the second time. On the other side I felt some of the dialogues were repeated from the Munna Bhai MBBS. Like when Munna goes to the Gandhi library circuit says padhai me dhyann de bhai, tension nahin lena ka. Or when circuit and munna decide to leave for the village, Munna asks what will you do in the village. For that circuit says main gaon jaavunga tho bail kya karegi?. When Munna Bhai MBBS was made, it was remade in Kannada(with Upendra as Uppi Dada MBBS) , Telugu(with Chiranjeevi as Shankar Dada MBBS) and Tamil(with Kamal Hasan as Vasool Raja MBBS). Will Lage Raho Munna Bhai be remade in regional languages? Lets wait and watch. What I feel is that when everyone comes out of the theatre after seeing the movie one is sure to have tilted a little for the Gandhiyan principles. Lage Raho Munna Bhai. Enna Thangadi was the first film to be released in Tulu in 1971. Tulu cinema is turning 35 this year. Rightly for the occassion, film Sudda made it into the international headlines few days back, with it winning the award for the best Indian film at the eighth Asian Film Festival "Ocean - Cinefan" held at New Delhi. The film is based on a Tulu play Bojja by Narayan Shetty Nandalike and was directed by P N Ramchandra. The film depicts the gradual fall of the feudal system in coastal region of Karnataka. Speaking of Tulu films, first film that strikes in my mind is Koti Chennaya with its immortal songs Padumaleda Brihma and Ekka Saka. Though the new version of Koti Chennaya was made and released this year it made less impact than the original. 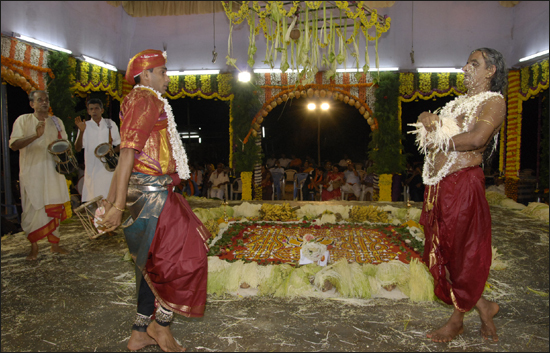 Koti and Chennaya were twin brothers and heroes of Tulu Nadu and their story is beautifully depicted in the film. Other films which worth mention are : Pagetha Puge, Beesaththi Babu, Tudar, Badkada Bile, Mari Bale, Bollidota, Sathya Olundu, Dareda Budedi, Kaasdaaye Kandani, Yer Malthina Thappu. K N Taylor is the prominent name associated with Tulu films with the films he made. More recently, in the 90's, one film which was huge hit and run successfully in Bangalore too was Bangar Patler starring Kannada actress Sudharani. It also won national award for the best film. It ran for 107 days in Jyothi Talkies in Mangalore. Another film which made in the 90's was September 8, directed by Richard Castelino, starring Kannada actor Sunil and Kannada writer, Dr. K Shivaram Karanth. The film was shot in 24 hours (One complete day from 6 AM to next morning 5 AM on September 8th - to be exact 23 and half hours) entirely in Mangalore, a record in the world cinema. 9 Cameras with 9 units were used for the completion of the film in the given time. To mark the 35th year of Tulu cinema a programme was held in Mangalore on Friday, August 25. Kannada actress Jayamala inaugurated the programme and music director V Manohar inaugurated the 7 day long Tulu film festival. Jayamala expressed her desire to make a film on Abbakka, the queen of Tulu Nadu who faught bravely against the Portuguese. Last year some 7 Tulu films were announced. Some of them had theatre artists like Naveen D Padil who has already made a name for himself with his Tulu dramas like Pudar Deethiji, Nervous Narayane, Oriyardori Asal. Hope to see more and more Tulu films hit the screens in the near future. Updates : 20th January 2008 : Kadala Mage was released in 2006 and went on to become a hit and had Diganth (of Mungaaru Male and now Gaalipata fame) in a lead role. Diganth hails from Theerthahalli, Shivamogga/Shimoga. Updates : 02nd May 2008 : Birse starring Tulu drama veteran, Naveen D Padil was released on 11th April 2008 in Prabhath Talkies, Mangalore. You can read the review of the movie here. You feel immensely happy when you see the hero winning in the end of the film fighting against all odds. Anybody remembering Revanth in the movie Beladingala Baale when at the end of the movie solves the puzzle to find the Beladingala Baale's address when he is in a chess tournament. We are like that. We wait till the last minute to do our work. Let it be the paying of bills, finishing the assignment in colleges or planning for a trip. And its more joyful when finish your work in the end when the pressure is mounting rather than you do it in the beginning itself. Out of the chaos you find the solution and it is better. You are more happy to see Indian cricket team winning the final against Australia after losing all the matches against them in the league stage rather than winning all the matches including the final. Strange isn't. Remembering a incident in the school days. Our teacher asked that how many of you would like finish the homework much early before the submission date. Hands raised were few. But when asked how many of you would like to finish the homework on the day before the submission date many hands were raised. Many of us still would remember the last minute assignment completion whether in school or in college. In college that was different, come early in the morning to college finish the assignment work just before the lecturer arrives. And how can I not mention the day or night before the exam when you yourself are tensed and get calls from all of your friends for those extra tips for the exam. Even remember some of my friends saying proudly 'I read all in the last 2 days and still able to finish and write the exam'. Our movies reflect our attitude and sometimes it influences the latter. We want happy adventurous endings in our films. So for all, the title suits the best "Heroes in the End".When success comes to you on a daily basis you are obsessed with it. So when greater challenge comes before us, we would enjoy facing it. Ok, now that it is all settled in football world about who the champion is, it is time to look back at the cricketing world and see what happened during World Cup Football. One change was prominent as far as the newspapers in India were concerned, that football was given wide coverage in the back pages and even in the front pages which predominently belonged to cricket news at any time in India. Not only national newpapers, even regional newspapers were not far behind in this. With this, cricket news shifted to more inner pages with photos in black and white. Important records were made, broken during this time. Waise bhi cricket me records ki kami nahi hai. Most importantly, it seems that 400 is no longer a run everest in an ODI which no team dared to climb in 35 years of ODI history, with already 3 teams scoring above 400 runs this year. Latest addition to this is Sri Lanka, scoring 443 for 9 against Netherlands. Australia climbed the run everest 434 for 4, March this year proudly. But joy of Australians was short-lived with South Africa outplaying them scoring 435 for 9 with a delivery left, thus the Australian record not even lasted for 4 hours. And now it is the turn South Africans with their record lasting not even 4 months. Cricket is like that, a game of glorious uncertainities. Partnerships in ODIs is one aspect of the game where Indians have built upon their own records, with wicketwise 5 of the partnership records are in the name of Indians out of 10. But this time their record 1st wicket partnership came under threat and broken again by Sri Lankans Tharanga and Jayasuriya putting on 286 runs for the first wicket against England. Previous best was between Ganguly and Tendulkar for 258 runs against Kenya. Coming to the impact of football on cricket, England team escaped big media bashing for their dismal 0-5 loss to Sri Lanka in the ODI series with most media covering more football news than anything else. Sachin's exploits in England gained mileage only in cricket sites like cricinfo.com but in otherdays he made news everywhere he went. Jayasuriya became the second highest in number of hundreds scored in one day cricket, a place jointly held by former Indian captain Sourav Ganguly. I bought Sportstar last week to get to know more about India's series victory in the Caribbean only to find out that only 4-5 pages dedicated to this, which covered the last two tests between India and West Indies. I thought sab football ki mahima hai. Can't wait to write this post after the historic win of Indian cricket team at Kingston. This was the series win all of the Indian cricket fans have been waiting from more than three decades. Finally the jinx has been broken and India have registered their first series win in the Caribbean after 35 years. Not to forget that this was the long awaited overseas series win after 20 years, last one being at England in 1986. Caribbean tour has not been the pleasant for the Indian team in the past. Last time India came close to clinching the series was in 1997 in the Barbados test when it was chasing a target of 120. Sadly at that time team was allout for a mere 81. And in 2001 India was leading the series 1-0 only to be outplayed by Windies 2-1 in the last 2 tests. After the ODI series loss 1-4 to West Indies nobody would have expected Indians to do well in the test series. Kudos to Rahul Dravid and team for their efforts to make sure that they win the test series. Though the score line may say the series win as 1-0 it would have been 2-0 or even 3-0 if there was some luck and little effort from this team. But win is a win and it has come at the right the time to boost the team morale after the ODI series loss. Though the win was a team effort, 2 persons stand out with exemplary performances, Rahul Dravid and Anil Kumble. Dravid kept his cool when the wickets were tumbling at the other end to make sure India did not bundle out for mere 100 runs in the first innings. Support he got from Kumble is tremendous, with the duo adding 93 runs for the 7th wicket. India were in dire straits with 91-6 then. Dravid's contribution of 81 and 68 will go as the best test innings he has played so far. Not to forget the contribution of Kumble of 45 in the first innings which was vital at that time. Harbhajan's 5 wicket haul certainly deserves mention here. And in the second innings it was Sreesanth who set tone for the historic win taking 3 crucial wickets of Gayle, Ganga and Sarwan. Munaf took the big wicket of Lara. Then it was Kumble all the way taking 6 wickets for 78 runs. For a man which may be his last Caribbean tour it was performance to cherish. One still remembers him coming to bowl with the broken jaw in 2001 to get big man Lara out for lbw and to get pat on the back from umpire David Shepherd. Kumble has been doing well in the overseas contrary to the notion of the critics in past couple of years. He has proved that once again. Kudos to Kumble. Next series ahead is the triangular ODI series in Sri Lanka comprising India, Sri Lanka and South Africa starting from 14th August, 2006 with India taking on Sri Lanka on 16th August. Though this series win may have hidden the cracks, but India have to work on the teams weaknesses such as some of its players playing below par and regain their one day form. Since the series is played subcontinent itself, there should not be any difficulty in doing that. Sri Lanka are upbeat with 5-0 ODI series victory over England where in the last match they scored 324 in just 37.3 overs. South Africa and India were tied at 2-2 when these two met last time in India. So lot of exciting cricket in store for the cricket buffs in the coming days. So series promises to be a close one. This historic series win in the Caribbean would go as one of the golden moments in Indian cricket. Indian cricket fans will remember this win for a long long time. Reading at the title of the post itself you must have got the jist of this write up. Yes it is about the wireless world or shall we say the mobile world, we are into. Now having a mobile phone is not a luxury but is sometimes a bare necessity. Gone are the days when mobile was meant only for the elite class, now you can find mobile phone in every hand atleast in India. With the many players in the field for providing you with the mobile hand set and connection to choose from the customer has a wide variety of choices never before. Today technology has provided us with choices that one now can have a very basic model with just messaging and calling to the most sofisticated model with camera, audio player, video player and whatever theat can be fit into a mobile handset. These little electronic gadgets have changed way the we communicate in a big way. Few years back one used to search for the STD booth for calling his home, when he is far away from home. Now you can call (provided the network is there in the area you are travelling) without any bother to your home or vice-versa. When you have somebody's cell number most of the times you are sure to reach the exact person you wish to reach unlike landline connection. Gone are the days when a decade ago caller was charged Rs.16/min and the receiver with Rs.8/min. With cell phones having in built audio-video players and camera etc, it has become quite easier to carry one gadget instead of many as many used to do when going to a trip or vacation. With bluetooth, infrared technologies you can also transfer data from one mobile to another quiet easily. The reach of mobile phones is amazing, throughout all sections of society regardless of the economic status. Mobile phones with their usage has certainly change the way people behave or act in public places. You are now made to hear to the private conversation one is having with his mobile without bothering surroundings. Ring tones with all nuisances comes up all of a sudden from nowhere. With the cell phones usage, people spending time on telephone conversation has increased by leaps and bounds. No matter how many times the organisers tell the audience in a meeting, show or any perfomance to switch off their mobile phone or keep them in silent mode hardly anyone listens. So it comes hardly as a surprise, when in the middle of some important discussion the annoying ringing tone takes away the charm. Cell phone buyers are often faced with problem of having plenty to choose from. More often than not one goes with the opinion of friends and of course the ads which influence the buyers quite a lot. Main concern for the cell phone buyers is the sudden decrease in price after they bought within 3-4 months itself. But that is the story with all the electronic items. So, you cannot predict the right time for buying the cell phone as is the case today with buying computers. The most common question asked when a number is called is "Where are you?". Surely sometimes this is very annoying. It may prompt the receiver to tell lies. Cell phones are here to stay. They have influenced our daily lives and continue to do so in the coming days with their new features. Following are some useful links if you are interested in Kannada Literature. I was going through the TIME Asia, June 19, 2006 issue with the cover story "INDIA'S NEW DAWN" in the public library. When I was reading the initial pages, there was mention of Tier II cities in India coming up in a big way and so I thought why could not this magazine feature the growth of my native town, Mangalore. And then there was article regarding Bombay(now called Mumbai) as the the crucible of the new India. After a few pages, to my surprise there was mention of my home town Mangalore growing up, in "Life is Calling" by Aravind Adiga with the photo of Hampankatta Circle with flash lights. I was very happy that a small town of coastal Karnataka, capital of Tulu Nadu, being covered in an international magazine. Truely, Mangalore has changed in last few years in a big way. It was tech giant Infosys which made its presence few years back. Then we had Mphasis coming and setting up shop here. With ONGC's project coming underway, Mangalore is coming up in a big way in the coming days. Importance of Mangalore is evident from the fact that two national english dailies The Hindu and Times of India starting Mangalore Editions. Mangalore now has got a multiplex and an auditorium, claimed to be Asia's biggest. With Mangalore airport getting international status, city is bound to grow in a big way. For Mangaloreans, Bombay had been the city of opportunities from several decades with many mangaloreans setting up hotel business or finding the job which was rare in Mangalore in those days. With the IT revolution, this has changed a bit with many of them going to Bangalore in search of jobs. Infrastructure is the main concern here as it is with other Indian towns. Proper planning of the city is the need of the hour, if it has to avoid the state of chaos which Bangalore is facing now where most of the time is spent in the unavoidable traffic. Tier II cities like Mangalore, Mysore, Hubli and Belgaum have to be developed as the attractive destinations for investments if one has to reduce the burden on Bangalore. Entrepreneurship is one distinguishing characteristic of Mangaloreans evident from the fact that four of the nationalised banks being started in Tulu Nadu, namely Corporation, Canara, Vijaya and Syndicate. One of the leading private sector banks Karnataka Bank also originated from Tulu Nadu. With the city growing to provide with more employment opportunities one can expect all mangaloreans who have left Mangalore for better opportunities to return back. The day is not far when people from here need not look at Bombay and Bangalore as the only alternatives. Happy to see one of my friends Shrinidhi's blog gets mentioned in The Hindu Business Line on June 26, 2006 in column by Swathi_CA. Congrats Nidhi. Blogs are getting noticed, making news. So all bloggers happy blogging. Till the next post comes up it is bye from Raveesh or as we say in Tulu solmelu. DoorDarshan or DD, seems like forgotten word nowadays. But there was one time, when only DD ruled. Most of them if not everyone, in their 20's now, must have grown up watching DD. There was a time when we never used to miss Ramayan or Mahabharath at 9 in Sunday morning. Then we had Surabhi, what I can say about this program which used to be the complete 'Bharath Darshan',which used to come at Sunday night 9. Movies only during the weekends, how eagerly we were waiting for the time to roll over to the show timings. Now we have channels, dedicated exclusively for movies, but the enthusiasm to watch the movies in TV, certainly has died. Agreed that one has a lot of channels to explore now covering from news, music, sports, movies, religion and everything what you can put on TV. But what I have observed in the households I have visited is that, more time is spent in the browsing of channels than in watching any. And there is one more thing, not all of them have the same taste. So hardly anybody watches TV now with the same eagerness in the DD days. Then there was Chitrahaar the programme featuring Hindi film songs and for Kannadigas we had the Chithramanjari. This used to be the only music programmes featuring film songs. Of course, now we have whole bunch of channels dedicated for music, serving TV audience. One can never forget the impact Guddeda Bhootha (a Kannada Serial in DD in those times), made in Karnataka, particulary in Dakshina Kannada District. Even today, people today talk of the serial and the impact it made. It is not that whatever we have today is worthless, the news channels broadcasting news 24 hours, watching movies in repeat telecasts, hearing music whenever we want, have certainly made our life lot better, but can not make such an impact such that the whole nation would come to standstill when there was Mahabharath on TV. But still in the remote villages of India, one still watches the same old DD with the same eagerness as before. Finally landed up starting a blog. Seems that I am little too late for joining the blogging community. But better late than never. Ok, I have named my blog "Ee Prapancha", stands for two things. Nowadays, having a blog is like having a e-mail id. Everyone has one. Publishing a material on the web has now become much simpler. More often than not, it finds the desired bunch of readers too. Hope to provide you all with more articles in the coming days.